MANILA, Philippines - The October 2017 Philippine Science High School (PSHS) National Competitive Exam (NCE) full results together with the list of passers for academic year AY 2018-2019 are officially released online on Tuesday, December 19, 2017. The 2017 NCE was administered by the Department of Science and Technology (DOST) to 26,413 examinees on October 21 in several test centers nationwide. This year's total takers is up by a thousand as compared to the previous year's NCE. The Secretary of DOST and Chair of the PSHS System Board of Trustees will announce the names of the successful qualifiers to the Philippine Science High School System (PSHSS) Search for Scholars for 2018. Of the 26,413 applicants, 1,361 (5.15%) successfully hurdled the one-step screening. Watch out for the announcement of results here (23:26 of DOSTv video) or view list of passers on this page. NCE results are usually being released every December. Same with previous years, it will be published in a major newspaper and on PSHS official website. Around 5-6% of the takers are expected to pass the examinations. 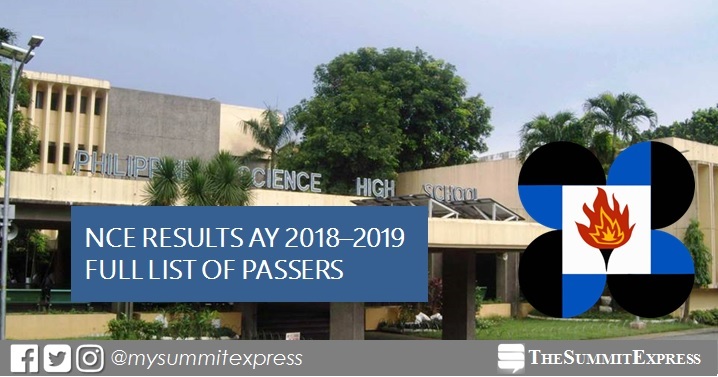 In the same period last year, NCE results were released after three months or in January 2017 due to the delay caused by super typhoon Lawin that hit Northern Luzon areas. Of the 25,405 applicants, 1,340 (5.27%) examinees successfully hurdled the one-step screening. In the 2015 NCE, 1,355 out of 22,791 (5.94%) successfully passed the exams. The test which was conducted on October 3 has results released after more than 2 months or on December 13. For the 2014 exam, results were out online on December 20, 2014. Of the 23,660 applicants, 1,303 (5.51%) examinees passed the exam that was administered in October 2014. The NCE is a scholastic aptitude test designed to measure Scientific Ability, Quantitative Ability, Abstract Reasoning and Verbal Aptitude of applicants. Applicants include grade 6 elementary pupil from a duly recognized school by the Department of Education who meets the following criteria is eligible to apply for the PSHS National Competitive Examination (NCE). preferably, be in good health and fit to undergo a rigorous academic program. PSHS scholars get a monthly stipend in addition to free tuition and free loan of textbooks. Uniform, transportation, and living allowances are also given according to financial need. Scholars are expected to meet the highest standard of scholastic achievement and behavior. The PSHSS is a specialized public high school system in the Philippines that operates as an attached agency of the DOST. It is considered as the top high school in the country and is viewed to be one of the best in the ASEAN region.